As a scholar, Dr. Jennifer Jones seeks to examine the social construction of race by exploring three distinct sources of change in the contemporary racial landscape -- immigration, the growing multiracial population, and shifting social relations between and within racial groups. By focusing on these three themes, she works to expand our understanding of how people become racialized and make sense of that racial identity, as well as how those identities impact social relations and politics. 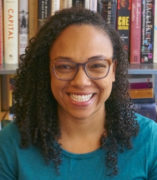 Specializing in race and ethnicity, immigration, political sociology, Latinx studies, Afro-Latinx studies, and Latin America and the Caribbean, Dr. Jones’ recent work can be found in such journals as Contexts, International Migration Review, Sociology of Race and Ethnicity, Ethnic and Racial Studies, and Latino Studies. Dr. Jones is also completing her first book manuscript entitled: The Browning of the New South (forthcoming with University of Chicago Press in 2019), which examines a case study of shifting race relations and the experiences of Mexican immigrants who have settled in the Winston-Salem area of North Carolina to explore regional racial change. In the book, Dr. Jones argues that in many locations throughout Southeast, Latinos are being situated alongside blacks as excluded minorities, who see African-Americans as allies rather than adversaries. Moreover, she posits that such changes have enormous implications for local, state, and national politics. Prior to joining the faculty at UIC, Dr. Jones was an Assistant Professor of Sociology at the University of Notre Dame and a Faculty Fellow in the Institute for Latino Studies. She also completed a postdoctoral fellowship at the Ohio State University in the Department of Sociology as a Social and Behavioral Sciences Diversity Fellow and received her Ph.D. and MA in sociology from the University of California, Berkeley.